December is the time for holiday cheer. From putting up the Christmas tree to wrapping presents, music has found its way into many of our holiday traditions. There’s nothing wrong with playing Mariah Carey’s “All I Want for Christmas” 12 times in a row, but Broadway lovers know that musicals are the best addition for any Christmas playlist. From original works to musical adaptations of iconic movies, these 10 musicals provide the perfect show tunes for any festive celebration. Whether you’re a fan of Angela Lansbury or Lucille Ball, Mame provides the perfect song when decorating your home and putting up the tree: “We need a little Christmas.” It’s bound to get anyone in the Christmas spirit...even as early as the week before Thanksgiving. Of course the New Irving Berlin Musical about the holidays makes the list. While the movie debuted the Christmas classics “White Christmas” and “Happy Holiday”, this tap dancing musical will bring festive cheer to any listener. And if you prefer to watch, the 2017 Broadway production starring Bryce Pinkham and Corbin Bleu is available on BroadwayHD. The 1960 black and white film called the Apartment was the inspiration for this bright musical. This show reminds us that Christmas is a time for office parties, family, and turkey. If your favorite part of the holiday is the food then “Turkey Lurkey Time” is the right song for you. And if you’re less traditional, cheers to A Fact Can Be a Beautiful Thing — guaranteed to throw a little joy your way. Welcome Christmas, come with way and listen to Dr. Seuss’ famous Christmas story as a musical. If you love to watch the cartoon version or Jim Carrey’s relatable portrayal, include this album with your Grinch appreciation. Maybe on Christmas Eve, you can be like a Who and sing around the tree. “December 24th 9pm Eastern Standard Time.” That’s the time most RentHeads spend their Christmas Eve listening to Act 1. This album will have you wanting to grab a group of friends and celebrate the holiday with a rousing performance of “La Vie Boheme.” And while the movie may not have “Christmas Bells”, you can enjoy their bohemian life on Netflix for both Christmas Eve and Day. ####Catch the upcoming Fox Live performance on Jan. 27th, 2018 or enjoy the filmed on Broadway version currently on DVD or streaming. Before the Tom Hanks and Meg Ryan movie You’ve Got Mail, there was She Loves Me — where pen pals fall in love through letters instead of AOL mail. Anyone can relate to the stress of “12 days to Christmas”, but the holiday romantics can truly appreciate the build up to the “it was you all along” reveal. Bundle up with a tub of vanilla ice cream and watch the 2016 production starring Laura Benanti and Zachary Levi available on BroadwayHD. Pasek and Paul - best known for hits like Dear Evan Hansen, La La Land, and The Greatest Showman - help bring this Christmas classic to a different level while keeping the nostalgia of the original. So when you need a break from TBS playing the movie all Christmas Day, relax with the album or watch Fox’s 2017 live production with Matthew Broderick, Maya Rudolph and Jane Krakowski. 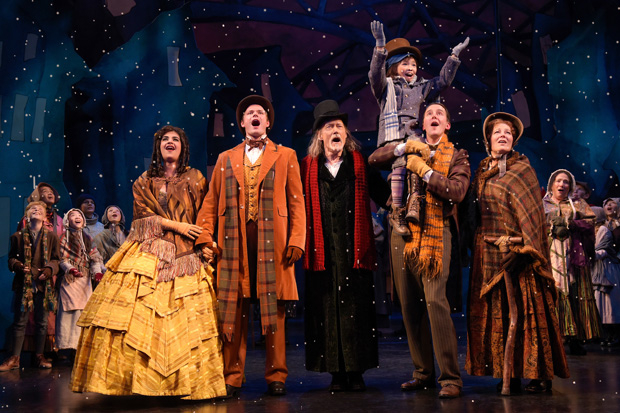 While the movie has similar features to Holiday Inn (an inn setting, Bing Crosby, Irving Berlin, and a few of the same songs including “White Christmas”), this screen-to-stage adaptation adds life and magic to the classic film. With a rich layer of theatricality, this album provides White Christmas fans a different experience of their favorite songs. Found on paper, stage, TV, or film, this Christmas classic seems to have done it all. With adaptations from the Muppets to BBC, and both dramatic and comedic, A Christmas Carol still remains a timeless tale. You won’t be saying “bah humbug” to Alan Menken’s music unless you’re a Scrooge.